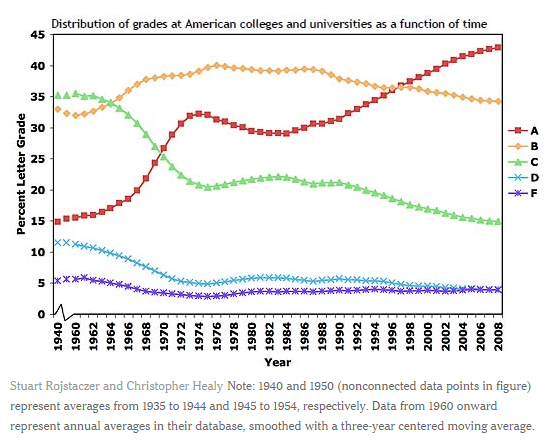 In the recent years, grades in American universities have become highly inflated. What are the reasons behind it and how it affects American students studying abroad? A 2011 study by Furman University Professor Christopher Healy and former Duke University Professor Stuart Rojstaczer confirmed the trend. They found that there has been a 28 percent increase in the amount of A’s students were given since the 1960’s and a 12 percent increase since 1988. The amount of B’s has stayed pretty much the same, but the number of C’s and D’s has significantly decreased (most likely to make up for the increased amount of A’s). “Their analysis confirms that the share of A grades awarded has skyrocketed over the years. The growing share of A’s instead comes at the expense of a shrinking share of C’s, D’s and F’s,” wrote the New York Times journalist Catherine Rampell. With A’s becoming the new norm in America, students coming to Europe to study are shocked when they receive B’s or even C’s on assignments. As one AAU professor explained in a class, “In Europe, a C is average and there is nothing wrong with that grade.” He then went on to explain that he would not award A’s just because a student did a good job on an assignment. “A’s are for extraordinary work,” he said. Although this method might seem fair for some of his European students, this makes it hard on study abroad students because “We have to go back to the states where that C is lumped in with our home university GPA,” said Mary Michael, AAU study abroad student from Washington D.C. To some U.S. students, “this method seems a little unfair,” said Michael. American student Hunter Laningham, from central California studying in Prague for the semester at AAU, talked about how assignments abroad are graded differently. “Grades are heavily based on projects and tests. You have to do well on the projects and when you have a test, you really have to know what the test is about,” she said. In the U.S. it’s easier to have some wiggle room when it comes to grades because there are so many different components that go into your final grade. Although grading may be tougher abroad, some students do, at times, appreciate it in a way. There are multiple reasons for grade inflation, which, according to the NYT article, have changed over time.“Grade inflation began picking in the 1960s and 1970s probably because professors were reluctant to give students D’s and F’s. After all, poor grades could land young men in Vietnam,” wrote Rampell. Now they believe that grades have continued to be inflated because education has a “consumer-based approach.” Rojstaczer and Healy say that professors today have both internal and external incentives to grade higher. “More generous grading can produce better instructor reviews, for example, and can help students be more competitive candidates for graduate schools and the job market,” wrote Rampell.